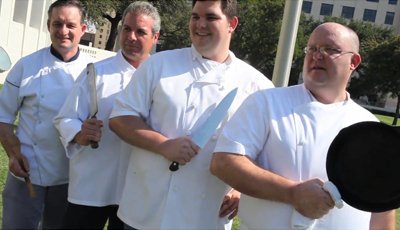 Web extra: Hear from some of Dallas's new and unheralded chefs in our video feature. It's cliché to paint Dallas as a city that likes things big. Whether it be stadiums, scandals or the name recognition of chefs at the restaurants we flock to, size has always mattered in these parts. We cheered Kent Rathbun, chef-owner of Abacus, not only for his achievements on the television hit Top Chef, but also for hoisting a moose head with his bare hands during the course of that series. And it was only a couple years ago when venues opened by a couple of the area's most famous kitchen celebrities-Stephan Pyles and Dean Fearing-took turns capturing popular fancy. They still hold sway, these big-name chefs. But since the moose incident and the glitzy grand openings, a group of nobodies began poking giant holes in our starry facade. As Dallas Fish Market neared completion, the owners tapped Randy Morgan to head the kitchen, and he quickly turned the downtown space into the city's finest seafood restaurant. Young Julian Barsotti arrived and his place, Nonna, quickly put a stop to all that "Dallas has no good Italian" talk. Then along came Graham Dodds at Bolsa, an Oak Cliff destination dedicated to fresh, local and seasonal ingredients-and last year's hottest new establishment. This year has been much the same. Nick Badovinus' return to the scene caused considerable buzz and two-hour waits for dinner at Neighborhood Services. More recently, Marc Cassel stepped back into the kitchen after a two-year hiatus, stirring much the same frenzy. Yet at the same time, the unknown (in this market) Sarah Johannes filed into the other much ballyhooed new restaurant, Wolfgang Puck's Five-Sixty. Almost immediately critics began mentioning her work alongside that of Anthony Bombaci (Nana) and Avner Samuel (Aurora). Jean-Marie Cadot worked quietly in North Dallas' Lavendou for quite some time, drawing little media attention. In 2009, he joined with chef Gaspar Stantic, setting up Cadot-a contender for best new restaurant. Out in Rockwall, Randall Copeland and Nathan Tate's AVA followed Bolsa's local-seasonal lead. "I think there's been a grassroots movement for four or five years now, but people weren't necessarily aware of it," Copeland says of the so-called "locavore" trend, which has allowed some of these new chefs to break into the culinary spotlight. "The guys at Bolsa had no idea the people that would come-it's working." Many of these new restaurants have adopted the local-seasonal-sustainable mantra to some extent. They've also been willing to discard the perks of a once pretentious scene, refusing to accept reservations, welcoming diners clad in non-designer jeans or even shorts, packing tables close together and so on. Unlike the 500-seat steak palaces that dominated fine dining in the late '90s boom, these guys think simple and small. Bella in Uptown boasts room for perhaps 50 guests. Lumi, the fun Asian-Brazilian dumpling spot on McKinney Avenue, allows for about the same, but parking for maybe 15 cars. Bolsa doesn't even offer valet parking. One of the owners, Chris Zielke, encourages new arrivals to pull up on the sidewalk. "Hey, this is Oak Cliff," he says, deliberately shrugging at big-city niceties. By consciously breaking traditional Dallas rules ("I grew up here and didn't know there were four seasons," Copeland points out, explaining the city's reluctance to join the "slow foods" movement), these chefs have eroded the tiers that defined nightlife for so long. One now sees ballgame attire at Bob's and Al Biernat's, while almost every restaurant with aspirations for success touts organic dishes. For his part, Barsotti eschews over-engineered dishes. "When I go over there [to Italy]," he says, "I come back inspired to be simplistic." David Pedack even took a step back, opening a bar on Henderson-Blue Collar Bar-featuring mid-century blue plate items, such as Salisbury steak. The big boys have, of course, taken notice. Rathbun followed Pedack's lead with a more extravagant Blue Plate Kitchen. And Pyles is ready to throw open the doors on an "international small plates" destination called Samar. However fresh these faces may seem to the local dining crowd, the rising stars have spent considerable time in professional kitchens. Copeland served as sous chef at the Green Room and then in Las Vegas before AVA. "It took me a good couple years-watching, asking questions," Morgan says of his seafood apprenticeship, which included a stint with Oceanaire. "There are so many ways and combinations to do fish." Christopher Short of the outstanding Bella served as executive chef for the Crescent Court and for The Mansion's private dining program. "It's not as glamorous as people think," he says of restaurant life. "You gotta have strong legs under you, because the day is long and the weeks get longer. "True enough. But their work is changing the way Dallas perceives both dining and celebrity. For the first time in quite awhile, smaller is better.